Firm, white meaty steaks make swordfish an excellent choice for the grill. The steaks cook quickly, taking about 4 minutes on each side, and they taste good plain or seasoned with a marinade or sauce. 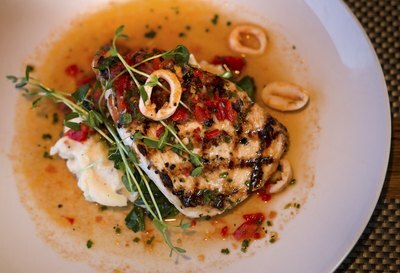 Swordfish pairs with a variety of summery side dishes, some of which can be grilled alongside the fish. For the best quality, look for steaks of about 1/2 to 3/4 inch thickness with a thin, well-defined bloodline. The simplest side dish to accompany grilled swordfish consists of vegetables grilled alongside the fish. 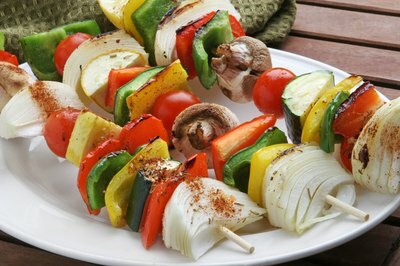 You can make vegetable kabobs on skewers for an elegant presentation, or grill cut vegetables in a grill basket. Use a mix of bell pepper chunks, summer squash slices, mushrooms or eggplant slices. Dress the veggies with a light vinaigrette. Or, halve zucchini and place them directly on the grill, along with spears of asparagus or endive. Grilled corn on the cob also make a good accompaniment, since the corn complements the sweetness of the fish. A summer slaw of finely shredded cabbage, which provides a crisp texture contrast to the denseness of grilled swordfish, can be prepared ahead of time, leaving you to focus solely on this fast-cooking fish. Dress the slaw with either a vinegar- or mayo-based dressing. 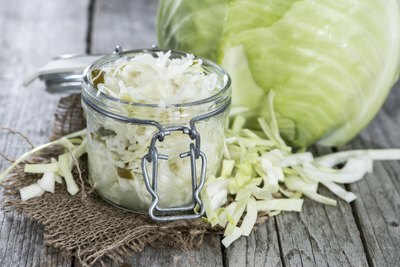 You can add other finely shredded vegetables to the slaw, or omit the cabbage entirely and make a slaw from a mixture of thinly sliced fennel, carrot, kohlrabi, broccoli stems, bell pepper or apple. Choose from additions such as sunflower seeds, thinly sliced scallions or red onion, fresh herbs, ginger, radishes or celery. Grilled swordfish pairs well with a chunky salsa, particularly a fruit-based salsa; the sweet-tangy flavors of the salsa make a welcome contrast to the meatiness of the fish steaks. 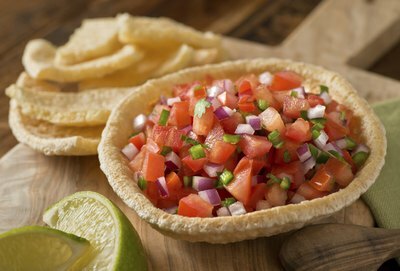 Try a papaya-black bean relish, an avocado-pineapple salsa or a mango-bell pepper salsa. Or, match swordfish with a more traditional salsa, whether it's made of corn and beans or tomatoes and cilantro. The acidity of a green tomatillo salsa makes a successful pairing with swordfish, offsetting the fish's fattiness. The slightly bitter quality of greens provides a pleasing contrast to the meaty character of swordfish, cutting through its richness with its bite. 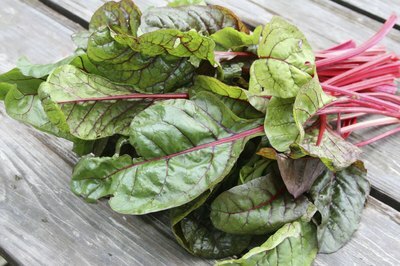 You can serve the greens cooked, in which case a simple saute of Swiss chard, collards, spinach or kale works well. For an outdoor summer occasion, however, consider preparing a salad ahead of time. A kale salad shines next to a swordfish steak, or choose a fresh arugula salad with lemony dressing. Swordfish pairs equally well with simple seasonings and big, bold flavors. Season the fish with the spices you like best.